Family Owned, Spacious 3 Bedroom caravan in the wonderful town of Shanklin. 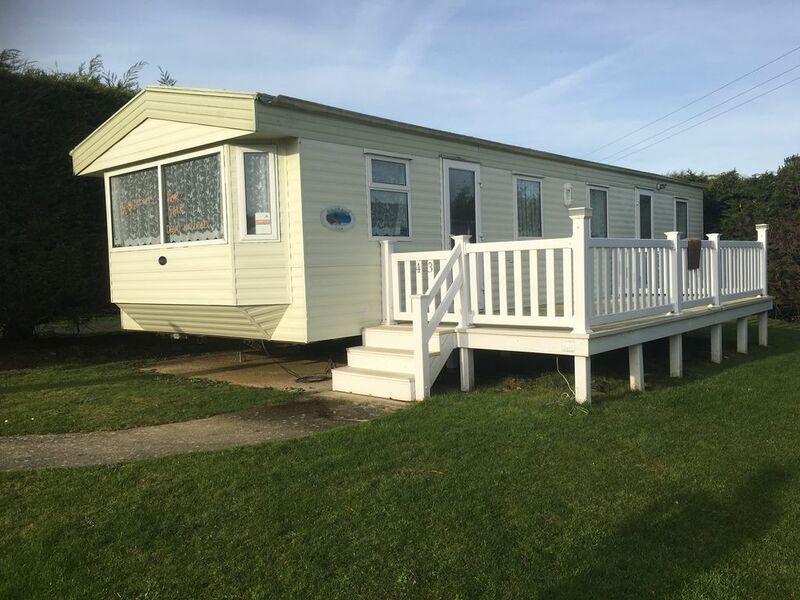 The caravan is located at The Lower Hyde Holiday park, and has Indoor and Outdoor swimming pools, Games Room, Playgrounds, Football and Basketball court, Bike Hire, Laundrette, Creche, Bar/Restaurant and a covenience store all on site. The Beautiful Shanklin beach is a 10 minute walk away, all amenities within walking distance. The Perfect Family Holiday. Private decking and private parking directly to the caravan. 1 private parking space, and extra parking available. Wifi Provided by the park for a daily fee. Can fit 8 with stools which are in the bedrooms. We really enjoyed our stay on the Isle of Wight. The site is in a good location for exploring and is family friendly. There is a handy Café/restaurant for cooked breakfasts and evening meals if you don’t feel like cooking. A supermarket is within walking distance for groceries and essentials. We really enjoyed our break on the Isle of Wight. The location was good for exploring and the site was family friendly. There was a Café/restaurant that was good for full breakfasts and meals if you’re not in the mood to cook. A small supermarket is within walking distance near the entrance to the site for groceries and essentials. The train station is also close to the site entrance and is a real experience in it own right! This property provides everything needed for your stay. Brilliant space, nice and spacious. We had a fantastic time in the caravan. Beds were comfy, shower was such a good size, nice spacious decking area. There was everything we needed ready and waiting, all we needed to bring were towels. It was very well cleaned and maintained. No complaints at all. Honestly can't say enough good things. Would recommend to anyone and can't wait to stay again. The property was clean and had a very spacious living area which meant there was plenty of room for all of us. It was well positioned on site near to the entertainment and play areas. It also had a reserved parking space right beside the mobile home. It was only a few minutes walk from the site to local shops and beach areas, and there was a supermarket almost adjoined to the site, so was in an ideal position. This was my first time to the Isle of wight (the rest of my party had all been before) and i enjoyed every minute! The caravan was spacious, clean and located the 'ideal' distance to get to the playground, pool, shop and entertainment (and with 2 kids in tow, we spent a fair amount of time on that route!). It was equipped with the stuff what we needed, including patio furniture so we could enjoy breakfast in the sun! We used the pools at the both parks (Landguard & Lower Hyde) and they were clean and well managed by the lifeguards. They do get busy, but the wristband system gives everyone a chance. The park is about a 10 minute walk (5 min drive) away from Shanklin beach, where there is loads to do including crazy golf, kids rides and amazing ice cream - thoroughly recommend the salted caramel. - Blackgang Chine & Robin Hill Family theme parks (you can buy dual entry ticket for both that works out more economical). - Eating out - Bargeman's Rest (Newport), great setting and good pub grub - Bodega (Ryde), great hot chocolate and cake!! - The Waterfront (Shanklin), brilliant atmosphere and service. And we had a great caravan to use as our base, which was the icing on the cake really. We had an amazing time and were sorry to leave!! There's a Lidl Supermarket right next door to the park, they have an on site bakery, where you can get fresh pastries, bread, croissant and etc. Please Note: There is a charge per caravan of about £64 per week to use the Park's facilities, Passes can be purchased at the office. Caravan price does NOT include facilities Passes.